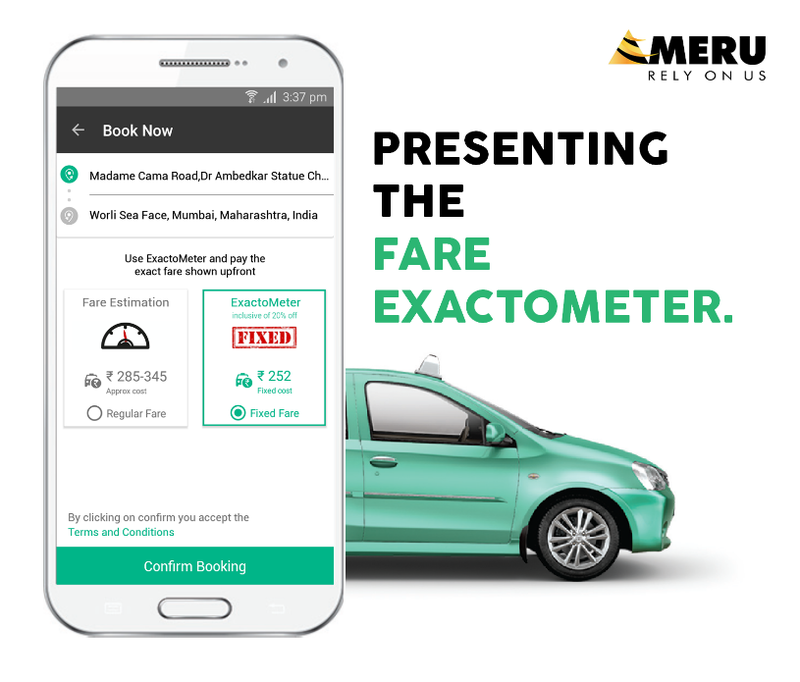 Meru Cabs launches ‘Fare Exactometer’, taking ‘Transparent Pricing’ to the next level. 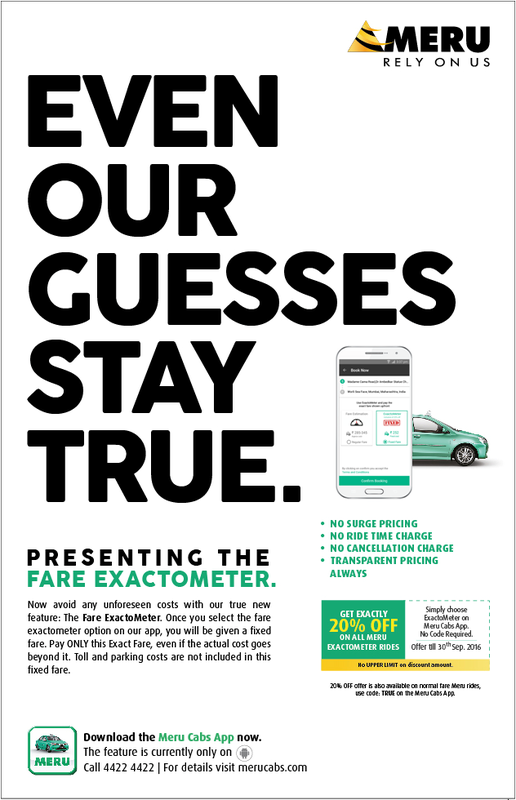 National, 12th September 2016: Meru Cabs, India’s most preferred cab service, today announced the launch of its accurate fare calculator called ‘Fare Exactometer’ highlighting its commitment to provide transparent pricing to its customers. Using the NEW feature in the Meru Cabs App, the EXACT fares will be confirmed to the passengers at the time of booking the cab itself. Under this feature, the total fare will be equal or lower than the fares prescribed by State Transport Authority, for the respective travel route & travel time. This feature endorses Meru’s tag line of “Rely on Us”. It helps providing peace of mind to the passengers by offering a fixed fare, which he/she has to incur for the trip, irrespective of travel conditions, like route, traffic on the road etc. In metros, travellers battle issues like surge pricing, high ride time charges and base fare without free km on a daily basis. Consumer’s need is a reliable & transparent travel solution; not the fare calculation nightmares with the complex fare structures prevalent in the market today. Based on this insight, Meru developed an algorithm that addresses this pain point of calculating travel fare between point A and point B enabling faster decision making process when booking cabs. This destination specific fixed fare feature for predefined travel routes, provides complete clarity on the fare charges as well as aids customers with the exact amount of his/her travel expenses for the ride. As a promotional offer, customers opting for Exactometer feature can avail 20% flat discount on all Meru ExactoMeter rides. Unlike other promotional offers in the industry, it comes with no upper limit condition on discount amount. The Exactometer is being rolled out in all major cities where Meru is operational and is currently available on Meru’s Android app. It will soon be introduced on other platforms as well. Last month, Meru launched a nation-wide brand campaign ‘True Rupees per Kilometer’ that highlights Meru’s brand proposition of providing honest and reliable services to the fast evolving transportation requirements of customers. Rolled out in 9 cities, Meru communicated their ‘NO hidden, NO Surge, NO Ride Time or NO Cancellation Charge’ policy to customers. Now, with the launch of ‘Fare ExactoMeter’, Meru is further strengthening its commitment towards transparent pricing. Since the launch of the campaign, Meru has seen a phenomenal response to its services signaling that customers appreciate/expect honest services. As a result of the campaign, the number of bookings on the Meru app increased by 25% as well as an overall increase in the number of Meru Cabs App customers by 200%. Meru Cabs, a world class cab service was launched in Mumbai (April 2007) in association with India Value Fund, a premier India centric private equity fund. Meru Cab has pioneered the concept of GPS/GPRS enabled cab service in India. Since its launch, Meru has continued to receive an exceptional response from the customers and is consistently distinguishing itself as a provider of superior quality transport. Meru Cabs service is available through its mobile app, website (www.merucabs.com) & dedicated call center at 44224422. Meru launched MeruGenie, a hatchback cab service in December 2013, which is now present across 12 cities in India. In January 2015, Meru launched Meru Eve, a cab service exclusively for and by women, to bring to the lady passengers a safe and reliable way to travel. Last month, Meru Enable was launched in Mumbai in association with Ezy Mov as India’s first wheelchair accessible taxi service, a unique service for people with special needs. Meru offers its world-class cab service across 24 cities in India under consumer proposition of Reliability, Safety & Transparency. Recognized by ‘The Limca Book of Records’ as the largest fleet taxi operator in the country, Meru has completed more than 40 million trips across India. Meru has been voted as India’s Most Favourite Cab Service by TripAdvisor Travellers’ Choice for 2 consecutive years 2013 & 2014; and has won various other esteemed awards like, Times Travel Award 2011, IT User Award 2008, 2009 & 2010. Recently Meru also received the prestigious Economic Time’s Most Promising Brands award for 2015.